Constructed in the mid 16th century as a symbol of solidarity between the Ayutthaya and Lan Xiang kingdoms, Phra Tat Si Song Rak is among the Isaan region’s most sacred chedis. Browse places to stay in Dan Sai on Booking.com. Book Now - Pay Only When You Stay. The two kingdoms -- one the predecessor of modern Thailand and the other of Laos -- allied themselves against persistent Burmese attacks in both the Chao Phraya and Mekong valleys at the time. Though the two sides resumed warring with one another a couple hundred years later, the chedi is still viewed as a tangible expression of friendship in a region heavily influenced by Lao culture. Leaning slightly to the south on its thick stone base, the lotus-shaped chedi stands 19 metres tall and is thought to contain relics of the Buddha. Women are not allowed to enter the immediate area surrounding the chedi. Frangipani and a large Bodhi tree ring a wider walkway just beyond reach of the chedi, making this a peaceful place to stroll around. Unlike some sacred temples, Phra Tat Si Song Rak happily does not attract a circus of touts and vendors. Reached by a gradual stone staircase, the chedi and an adjacent shrine room sit atop a hill overlooking the town. A second structure houses a Tibetan-style Buddha image -- unusual in Theravadan Thailand. 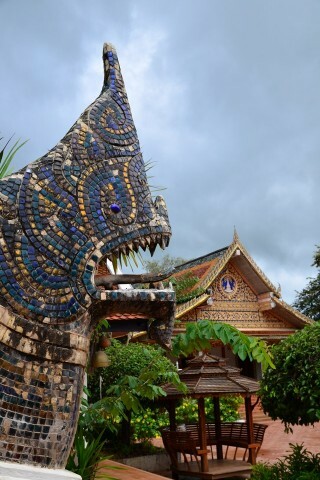 The complex is also unique in that no monks reside here; instead, it’s overseen by the same local spirit cult that presides over Phi Ta Khon. During the festival, locals shower the chedi with offerings of ton phueng, cone-shaped banana-tree stems adorned with yellow wax flowers. Phra Tat Si Song Rak has unusually strict rules. Clothing that covers shoulders and knees is a given at any temple, but visitors also must refrain from wearing red clothes or hats. Umbrellas and children under three years old are also not allowed. Red symbolises blood and violence, and superstition has it that the colour would be a bad omen for the sense of friendship implied here. Follow Route 2013 west to the junction with Route 2014, take a left and you'll see the gates almost immediately on the right-hand side of the road. It's no more than a 15-minute walk from Wat Phon Chai. Open daily 8:00 to 17:00.